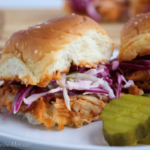 BBQ Chicken Sliders – so easy with a store-bought rotisserie chicken. The perfect game-day snack. In a bowl, mix mayo, vinegar, sugar, celery seed, salt and pepper. Mix BBQ sauce and chicken in a bowl. Cut buns in half – all at the same time. Place the bun bottoms into a casserole dish. Top with chicken and BBQ mixture. Place bun tops on sandwiches. Brush the tops with melted butter and sprinkle with salt. Cover with foil and bake for 10 minutes. Uncover and bake for another 5 minutes. Remove tops and pile on slaw mixture. Replace tops, cut sandwiches and serve immediately.